But I expected to feel a little lost in reading a new genre, and I didn't mind very much. There was a lot that felt familiar, too, for those that know the fantasy and science fiction genres well - a once-prosperous place now fallen on hard times with a large population and limited resources. Failing infrastructure. A long, never-ending war that has taken away the heroes and left the defenseless alone. You know the story, right? But that's where de Bodard takes off into the awesomeness of a feminine perspective and an East Asian influence. It is so rare (really, ridiculously rare) to see a woman's perspective in fantasy and science fiction, and even more abysmally rare to see the perspective of someone of color. It was so refreshing to read this book, with its two central characters both women, and neither of them with a romantic interest or "God, I wish I was prettier" thought in their heads for the whole book! Rather, both women were concerned about their friends and family and their ways of life. You know. Things that normal people care about. And, much like in real life, there is no villain in this story. There are just people with different perspectives who misunderstand each other and want different things. And the Vietnamese perspective was so great, too. 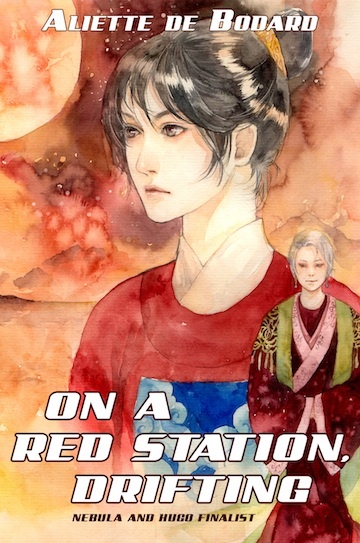 On a Red Station, Drifting gave me such a zing of excitement because it is such a wonderful example of all that fantasy and science fiction can and should be. It provides such a unique lens on the traditional hero story, one that includes things that are so important in Eastern cultures: respecting your elders, ancestor worship, and strong family ties. de Bodard brings these themes into her novella so seamlessly that you can easily imagine a future in which Eastern culture dominates, and see just what the positives and negatives of such a culture would be. I'm pretty impressed that de Bodard was able to pack so much punch into such a short novel. Clocking in at just over 100 pages, On a Red Station, Drifting is not a huge commitment and therefore is an excellent introduction to the science fiction genre. It's also a lovely reminder of how many different ways there are to tell a story, ways that are influenced by culture, history, gender, religion, and different ways of viewing the world. Highly recommended. I agree! I think everyday life in space sounds so fascinating! How do they cook, for example, with potentially no oxygen for fire? It IS ridiculously rare to get the viewpoint of a woman of color in speculative fiction. Am I being overly optimistic to think it's getting a little bit better? Or does it just seem that way to me because I'm seeking out more diverse fiction these days? I am not sure! I think I am in the same boat as you- I actively seek it out. But I think it MUST be getting better as it can't be getting worse. But I linked on twitter to an NK Jemisin speech (and will link to it on the blog soon, too) and it sounds like she says that while more POC and women are being published, they are all being bullied horribly. Reading the summary I thought it sounded alright, but as you went on to talk about the uniqueness, I was definitely intrigued. I've read a few women-centric fantasies but none without the romance or thinking you say this lacks. And the normality and no villain is so appealing! I, of course, had to buy this book immediately after reading your review. Thank you for making it sound like a must-read!